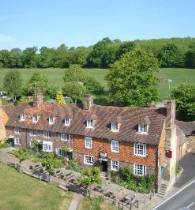 Our family run Free House is one of the oldest pubs in the South of England, dated to 16th century and is located in the pretty village of Groombridge. 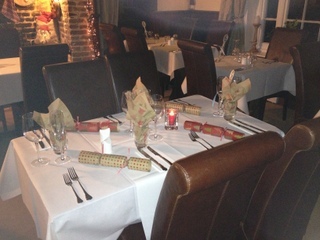 Come and try our traditional English cuisine in the cosy beamed restaurant with log fires to keep you warm. We have a set menu and a daily specials board that caters for all tastes. Our Sunday roast is a mouth watering experience!! Family parties and special events can be catered for. However our pub is popular and therefore please discuss your requirements as early as possible. 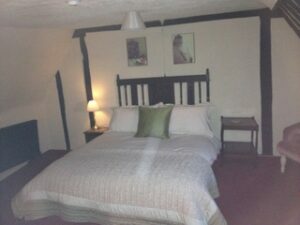 The Crown Inn has 5 cosy double and twin bedded rooms which each have a hand basin and shared bathroom. One room has en-suite facilities. Rooms are booked on a B&B basis and charge include a full english breakfast. Located in Groombridge Village the pub is just across the road from the well known attraction Groombridge Place, which offers lovely gardens, boats on the river and the Enchanted Forest – a magical place for children to explore. . It is also close to the picturesque Sussex villages of Withyham, Hartfield – the home of Winnie the Pooh, as well as the Ashdown Forest and and the historic town of Tunbridge Wells. A wide range of activities including rock climbing, golf, horse riding, cycling and fishing are available close by. Historic Houses and Castles including Hever Castle, Leeds Castle, Scotney Castle, Penshurst Place, Sheffield Park and Chartwell, the home of Winston Chuchill are all within a short drive. The Crown Inn is well known for its popular Friday Night Steak Nights. Regular Quiz Nights are held on the last Wednesday of the month.